Jason Smith is the grinning bald guy seen here in the middle at a recent Mortified show. The other people are awesome, too. But more on them in a sec. Once upon a time, Jason was a starry-eyed Minnesotan teenager who wrote a short script inspired by the cinematic gem that is Days of Thunder with the hopes of it someday attracting Hollywood names. Years later, the adult Jason realized his script actually sucked-- pretty hard in fact-- and decided to do a reading of it in Mortified. Not ones to let him down, we decided to fulfill his younger self's dreams. So we secretly invited a few of our very favorite actors to join Jason (not an actor) in a live reading of his teenage racetrack masterpiece 500 Miles to Indy. And amazingly, they agreed. 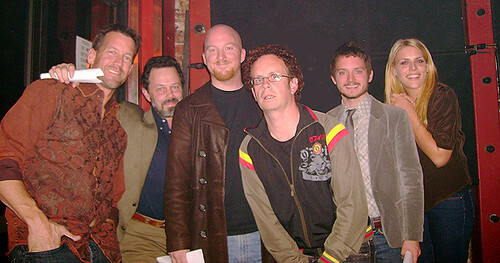 Behold, the Mortified Community Players featuring (from left to right) James Denton, Curtis Armstrong, Kevin McDonald, Elijah Wood and Busy Philipps. And yes, we are just as confused as you. Adding to the fun, we decided not to promote this (or any of the night's many surprises) ahead of time. Our way of giving our fans a treat, thanking them for 4 years of fantastic support. The result was a surreal experience for Jason, for us, and presumably anyone else who is a total spaz for Kids in the Hall, Freaks & Geeks, Better Off Dead, Desp. Housewives or things involving Hobbits. More info on the rest of this event, its other fun surprises, and why Neil Katcher is such an awesome producing partner who I totally forgot thank on stage because I am a schmuck, coming soon.